To prepare the marinate clean and thoroughly wash out the Raw chicken pcs. Take another pan add 2 tsp of ghee heat it. To this add Cinnamon ,Cloves , Bay leaves and Cardmmom once the aroma starts heating your senses pour this mixture to the kadai in which u are frying your onion . 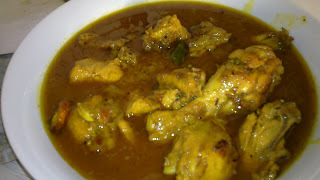 once all the flavours of masala starts heating your senses finally add 2 cups of water to this. Allow the curry to simmer for next 5 -10 mins.. When the curry thickens at this point turn off the heat and add finally chopped coriander leaves. enjoy!!!! and please share your experience with me.